Bobby Zamora showed Blackpool’s forwards how to be incisive and decisive as Fulham controlled the key areas of the pitch and the game to record a deserved victory. 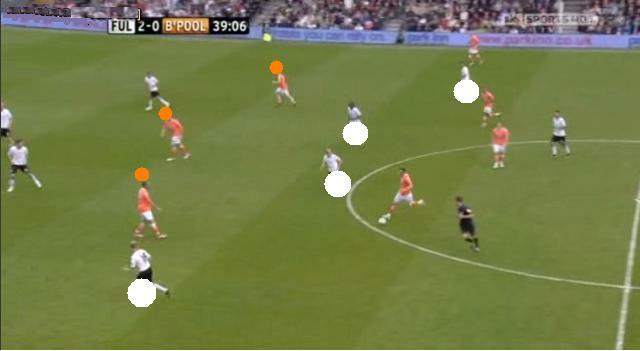 For all the possession that Blackpool had, their forwards were too static, reducing their attacking options. Arguably the initiative was handed to Mark Hughes through Ian Holloway’s team selection. The key decision seemed to centre on the inclusion of James Beattie in order to add extra height against a Fulham side whom he thought possessed great height and aerial ability. This was a strange move as Holloway normally tends to veer towards the positive selection based on his team’s strengths instead of countering the opposition. 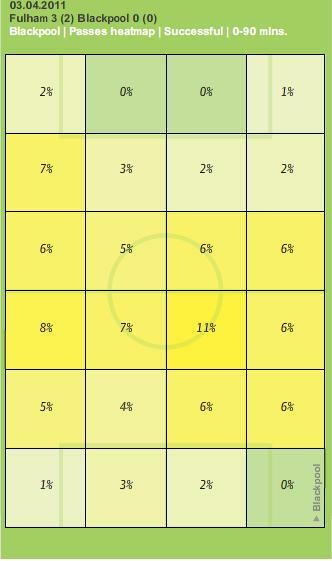 Fulham set up in a standard 4-4-2 but their work within that framework closed out any space Blackpool might have normally found against a 4-4-2. 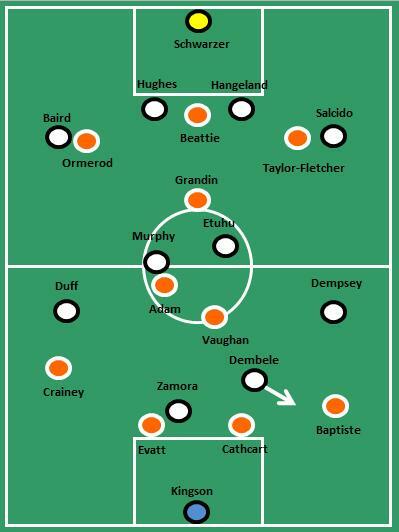 Fulham controlled the space in midfield superbly to gain control of the game. 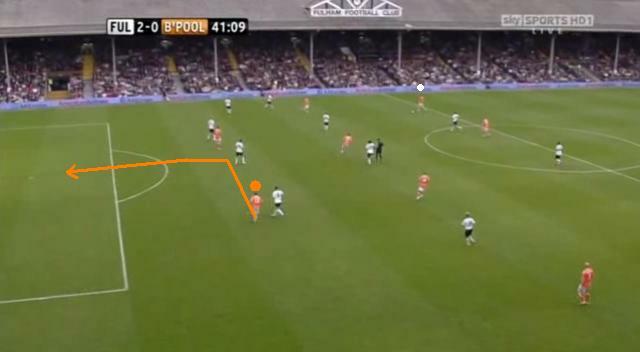 Their midfield four sat narrow and applied pressure to the Blackpool midfield to disrupt their flow. You can see from the picture below how the midfield sat narrow out of possession with Dickson Etuhu and Danny Murphy closing the space in the centre and Clint Dempsey and Damien Duff moving in off their wings. Fulham sat narrow off the ball in midfield bringing in their wingers to support their two central midfielders. Etuhu had a particularly good game working hard in the tackle especially in the first half. In total he made 9 tackles winning 7 of them with 5 of those coming in the first half. 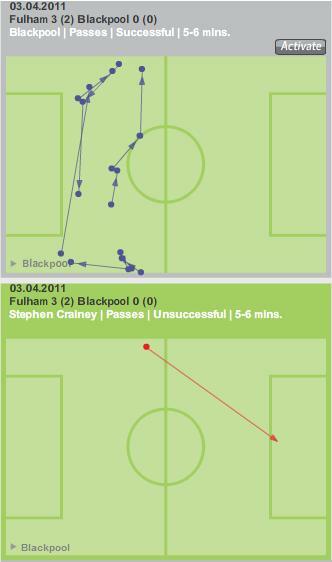 The picture above serves to illustrate the second key point of the game, the static nature of the Blackpool’s statuesque forwards. Arguably the key points of Blackpool’s game are good possession of the ball, linking up with effervescent movement up front, leading to excellent passing opportunities and subsequently chances at goal. 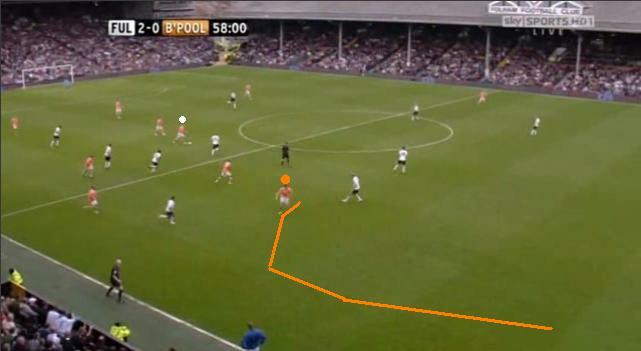 The picture above shows the three Blackpool forwards all but stood still, two of them out of the game and the one offering to receive the pass is doing so whilst strolling away from the goal. Arguably Blackpool’s forwards only made two runs of great note and they both led to chances. Both runs were usual fayre for Blackpool but such a rarity in this game that they deserve to be picked out as illustrations of good movement. Firstly, Brett Ormerod runs across the pitch in behind the defence, before curving his run as he reads the pass from Craig Cathcart. You can see his run tracked below. Ormerod making a rare insightful run. The second run was made by James Beattie, presumably fresh from half-time instructions from his manager to make runs in to space instead of standing still. Here he pulls off in to the right wing before heading down the line and then inside the box to narrowly miss the target. Resembling the Jacko statue outside Craven Cottage Beattie rarely moved intelligently, when he did he nearly scored. Great movement, but two examples in a game which Blackpool comprehensively dominated in the passing game is a poor return. Of Blackpool’s passes, 56% of the successful passes were in the middle third and 27% in the defensive third leaving only 17% of total completed passes in the final third. A whopping 442 passes were in the defensive and middle thirds and Fulham was more than happy in letting them dominate. Got to be starting something? Yes. But not creating or finishing. A combination of good possession and lack of options in attack was all too familiar in this game. The chalkboard below was the story of Blackpool’s afternoon. You can see that a nice passing move commences in the 5th minute along the back line, in to midfield before a hopeful punt up field from Stephen Crainey conceded possession. Pass and move. Tiki-taka. Boof-hoof! Blackpool now have four home games on the spin and these games will most probably decide their Premier League fate. Holloway came back from Spain this week full of ideas and in time it will be seen whether he has learned anything from that experience. However, he will now be focusing on ensuring that his statues from Craven Cottage don’t pop up again next week at Bloomfield Road against Arsenal.